A beautifully feathered rooster is a striking sight. You may have noticed a few feathers lying around the yard now and then, though, and wondered if it is the hens or the rooster who is losing them. Actually, it's likely to be a little of both. Under normal circumstances it's natural for roosters to lose feathers, although excessive feather loss could be cause for concern. Birds molt, and roosters are no exception. When your rooster is in a molting phase, he'll shed old feathers and grow new ones. This typically happens only once a year, and it's usually in the fall in preparation for the cold winter months ahead. Some roosters lose only a few feathers at a time, while others might lose all their feathers at once. 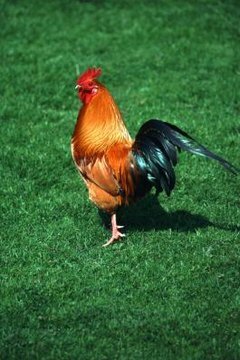 Generally roosters go through their first molt at around a year old, and this rite of passage signals that they'll be ready to mate the following season. It takes a lot out of a rooster to grow a batch of new feathers after losing the old ones. Chicken farmers usually watch their roosters closely during molt for signs of weakness or illness to determine which roosters are the strong, vigorous birds in the flock. Parasites like fleas, lice and mites are a common cause of feather loss. If lice are the culprits, you'll find them at the base of the feathers. Mites and fleas are harder to track down, as they don't usually stay on the rooster's body. They just show up at night to dine on your bird, but in addition to feather loss, you'll see signs like scratches and sores on his skin. Fowl pox is another condition that can cause your rooster to lose feathers. This condition is obvious from the pimple-like sores that you'll see on your rooster's skin, made more visible when he loses feathers. Poor nutrition or even changes in your rooster's diet can be a reason he loses feathers. Protein is a specific nutrient vital to production of feathers and maintaining healthy follicles to produce and hold on to those feathers. The National Research Council advises that adult roosters need 12 grams of protein a day to stay healthy. If your rooster began losing feathers after a change in feed, check the nutritional information and compare the protein content to that of his old food. If the old food has a higher protein content, switch back or talk to your vet about protein supplements. Chickens are aggressive birds, and if you have more than one rooster, fighting among the boys could be the cause of feather loss. They'll peck at each other, jumping on one another's backs while pulling out neck feathers with their beaks, and tugging away back feathers with their feet and toenails.